This is it folks, the area on Comet 67P/Churyumov–Gerasimenko where the Philae Lander will touch down on November 12. The ESA has officially given the green light for its Rosetta mission to deliver the lander in the first-ever attempt at a soft touchdown on a comet. We now have the timeline of events and an animated simulation. 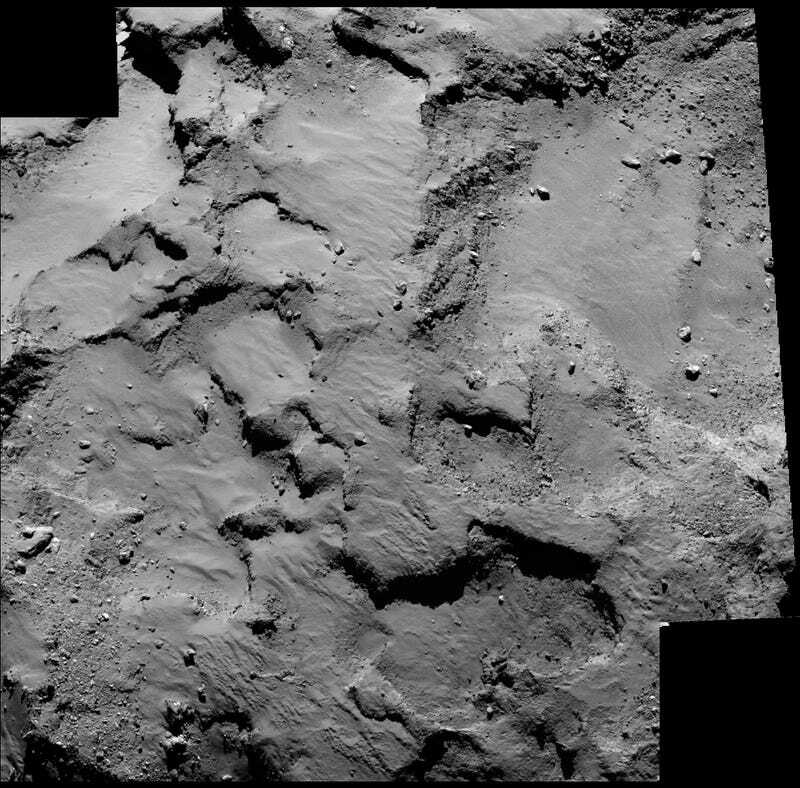 This stunning image was captured by Rosetta's OSIRIS camera from a distance of about 18.6 miles (30 km). The view of landing site J, which is located on the "head" of the comet, is scaled at 0.5 meters/pixel, so it's still a fairly wide perspective. The 'Go' for site J also confirms the timeline of events leading up to the landing. The action gets started on November 12 at 08:35 GMT/09:35 CET when Rosetta releases Philae at a distance of approximately 14 miles (22.5 km). Touchdown should happen about seven hours later around 15:30 GMT/16:30 CET. But due to the signal delay to Earth, we will be behind by 28 minutes and 20 seconds. This animation shows Rosetta's orbit in the lead up to, during, and after lander separation. The animation begins on October 1, 2014 when Rosetta is orbiting about 12 miles (19 km) from the comet. This infographic shows what Philae will be doing during the descent. All being well, Rosetta and its lander will begin communications about two hours after separation. It will take a 'farewell' image of the Rosetta orbiter shortly after separation, along with a number of images as it approaches the comet surface. It is expected that the first images from this sequence will be received on Earth several hours after separation. The first sequence of surface science experiments will begin about an hour after touchdown and will last for 64 hours, constrained by the lander's primary battery lifetime. By March 2015, the comet will be so close to the Sun that temperatures inside the lander will have reached a level too high to continue operations. At that point, Philae's mission will come to an end.